Claire Ridgway, step by step, took me behind the scenes and personalities of Anne Boleyn’s fateful march from her queen’s throne to the Tower of London scaffold. I was struck by the depth of research and Ridgway’s passion for finding the truth. When the outcome was ambiguous, she said so and left it to readers to make up their own minds as to the guilt or innocence of Anne and the men who were charged and died with her after a mockery of a trial. With this book, Ridgway gives Queen Anne Boleyn the justice she was denied almost 500 years ago. She has performed a service for history. I have ploughed my way through many books about Anne Boleyn and her spectacular fall in 1536. Many of those books were brilliant, some not so brilliant. Among the best are authors and historians such as Eric Ives whose biography of Anne is superb. When I first heard about this book I wondered what would be so different about it that would make it stand out when so many books have already been written about Anne. I read it with a completely open mind, while wondering what I would gain from it. What I discovered was that I gained an enormous amount from it. Let’s make it clear that this look at Anne’s fall is not intended as an attempt to replicate what has gone before. Ives’ biography of Anne, while superb, is not for a novice or the feint hearted! This is an entirely different approach to the subject. It is intended to be a clear, concise and easily digestible reference for Anne’s fall, which I think achieves it’s primary purpose.It sets out a day to day diary of events building up to Anne’s execution in May 1536, setting out details of the main characters involved. Most importantly of all it does so using all of the original source material available, with explanatory commentary by the author, Claire Ridgway. All angles of the story are looked at and researched, and all possible causes for the tragedy are investigated and dissected. But although Claire gives her personal views, backed up with compelling and logical argument, she makes it very clear that the story is open to different interpretations, meaning we as readers are allowed our own opinions, whilst fully appreciating the logic behind the writer’s views. The greatest achievement of this book is that if you are a complete novice to the story of Anne Boleyn then you will feel, after reading it, that you will be able to talk with confidence on the subject. Yet even if you are not a novice to the story then you will find that everything you know, or thought you knew, is here in what is a comprehensive, while readable look at the story of Anne’s fall. I think that’s what makes this book so unique and so worth reading. It gives all the information you need in order to understand Anne’s fall, leaving nothing out, but does so in a way that I don’t think has been achieved befored i.e. in a way that anyone can read and enjoy with ease. Once again, Ridgway has skillfully captured the stunning events leading up to Anne Boleyn’s execution in a familiar yet thoroughly researched manner. This book would be useful to a variety of audiences. The author thoughtfully lists the participating “characters” within the book, a timeline for quick and easy reference, the events of 1536, all broken down in order to follow with clarity and little confusion. Ridgway successfully incorporates familiar language as well as exerting a authoritative and knowledgeable tone in re-telling the tragic events that led to the execution of Henry VIII’s second queen consort. As always, her thorough research and referencing has helped me and my research as I navigate through the sometimes hectic world of sixteenth century primary sources. Ridgway appears to back up her argument with such ease; it leads the reader to believe she had actually lived to see these horrifying events. Additionally, the author’s passion for the subject of the innocence of Anne Boleyn is not lost in her writing. Anyone reading this book would be sympathetic to a misunderstood and intelligent woman judicially murdered by her own husband, whom she loved and care for. Another success for Claire Ridgway! There have been many accounts of Anne Boleyn’s fall in the past; however, this book has an important contribution to make. Claire has somehow managed to synthesize all the facts associated with the coup against Anne and the Boleyn faction in 1536, and presented it in a a hugely readable and concise format that deserves applause. Presented in a diary-like format, Claire takes the reader through a blow by blow account of the events as they occurred and the main protagonists. This book is not trying to unearth new theories but provides a very accessible (and thorough) summary of the ‘must know’ facts. In this respect, it finds its own unique place in the market. 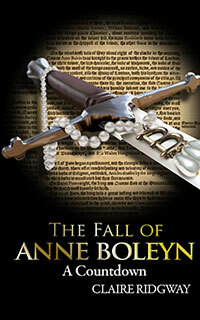 A great addition to any Anne Boleyn fan’s book shelves! – Sandra Byrd, best-selling author of To Die For: A Novel of Anne Boleyn.